Tonight’s support act for this special MaYaN show was Dutch My Propane. They released their new album, “Antidote” just over a week before the show, so this was basically an album launch show for them. Their songs are fairly long, especially when played live, so their 40 minute set consisted of just 6 songs. Of those, five were from the new album, with just “Waves” being an older track. The smoke machine was on overdrive, so at times they were hard to see but it was a good set – not the best I’ve seen from them but still a good start to the night. Then after an interval and slightly earlier than advertised, MaYaN took to the stage. They’d advertised that this would be a special show with them doing two sets – one of their normal material, and one of them playing songs from the previous or other bands of the MaYaN members. Before the gig I’d assumed the “classics” set would come first, but instead they kicked off with the “normal” set. Like My Propane, they focussed on the latest album (Dhyana), with all but one of the songs coming from “Dhyana”. MaYaN are an amazing live band – typically there are between 10 and 12 band members on stage at any given time because as well as a drummer, bassist, two guitarists and a keyboard player plus a cellist for some songs, you’ve got multiple vocalists – some songs have three lead vocalists plus two backing vocalists. It’s an amazing pool of vocal talent and it’s not a case of having dedicated backing singers – most of the backing vocals come from Marcela Bovio and Laura Macri, but they also do plenty of lead vocals too. It’s not just the sheer number of people that makes a MaYaN live show impressive – it’s the energy they all have and how much fun they’re clearly having. People are constantly coming on or off stage, or moving around, and as you watch the different people you see lots of interaction between them – laughing and joking, the two guitarists playing each others instruments and more. This set of their own material was simply superb and had the show ended there I’d have still said it was a great night, but there was far more to come. With all the band members either being in other bands (e.g. 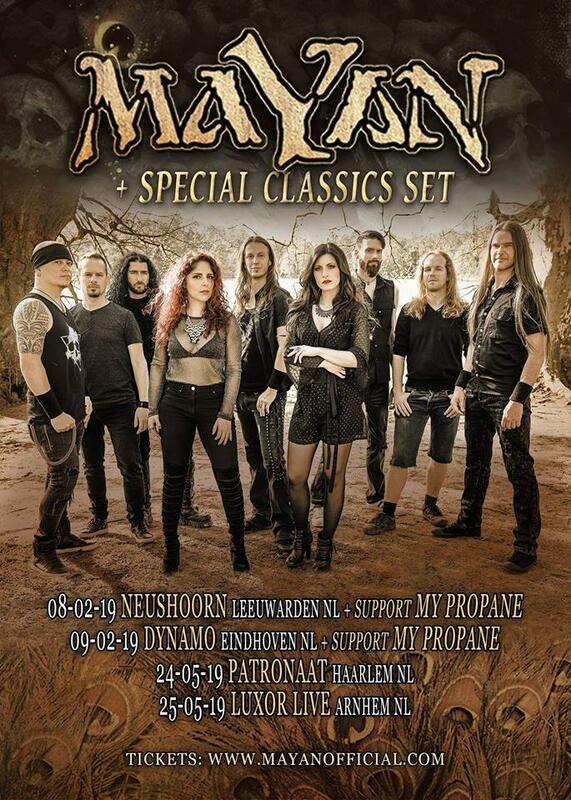 Mark Jansen is in Epica, Merel Bechtold is in Delain and Purest of Pain), or having been in other bands before MaYaN (e.g. George Oosthoek was in Orphanage, Jack Driessen was in After Forever, Marcela Bovio was in Stream of Passion) then a set of covers from some of these associated acts had a lot of potential for them to pick from, so waiting to hear which bands and songs they picked was exiting. The set kicked off with Marcela taking lead vocal duties to sing a Stream of Passion song – “Monster”. It sounded fantastic, and I did wonder how former Stream of Passion bassist Johan van Stratum felt hearing it from the audience after years of playing it on stage. From there we had songs from After Forever, Epica, Orphanage and God Dethroned as well as two classical pieces where opera singer Laura Macri took lead vocals. The Epica covers were really good – Laura Macri did most of the lead vocals that would normally be sung by Simone Simons, with Marcela Bovio adding extra vocals and Mark Jansen doing his growling vocals. I really didn’t know any Orphanage songs, but the way they were performed tonight they sounded great – I’ll have to check out some of their songs now. There was even a God Dethroned song which I don’t think anyone expected but which went down well. A two song encore of MaYaN songs ended the night. I’d been up early (5.30am) to travel to this show, and there’s no doubt in my mind that it was well worth the trip – MaYaN are a stunningly good live band and the classics set was an added bonus that lifted it from a fantastic gig to being one of the best I’ve been to for quite some time.